I started with the recipe from AllRecipes.com, one of my favorite sites for recipes. I particularly love how they calculate nutritional information, and have Metric for US conversion. Toss the Raspberries and Pears in an oven-safe dish. Add the white sugar, just enough to bearely coat the fruit. Set aside. Preheat oven to 425 degrees F (220 degrees C). Grease and flour one 8 inch round cake pan. Beat together the egg and soy cream. In a medium bowl (I used the KitchenAid mixer bowl) combine the flour, baking powder, 2 tablespoons white sugar and the salt. With a pastry blender cut in the butter until the mixture resembles coarse crumbs. Make a well in the center and add the beaten egg and cream mixture. I blended this with the mixer for less than a minute, pulsing through trying not to toughen the dough. I find this better than touching this dough, because in baking pastry, touching the dough burns it and changes the flavor. Spread the batter into the prepared pan. Bake at 425 degrees F (220 degrees C) for 15 to 20 minutes or until golden brown. Let cool partially in pan on wire rack. Put the fruit in to bake about halfway through. Bake the fruit at the same time, but in a separate dish for about 15 minutes, or until the pears go soft. About 10 minutes through stir in a tablespoon of butter. While the cake is cooling, sieve the fruit gently, separating out fruit from sauce. Put the sauce in a saucepan, add a drop of soy cream, and stir over a low flame, for about five minutes. Remove from heat. Expect a literal “short cake”, something a little denser than the AllRecipes version. Slice partially cooled cake in half, making two layers. Place half of the the fruit on one layer and top with the other layer. 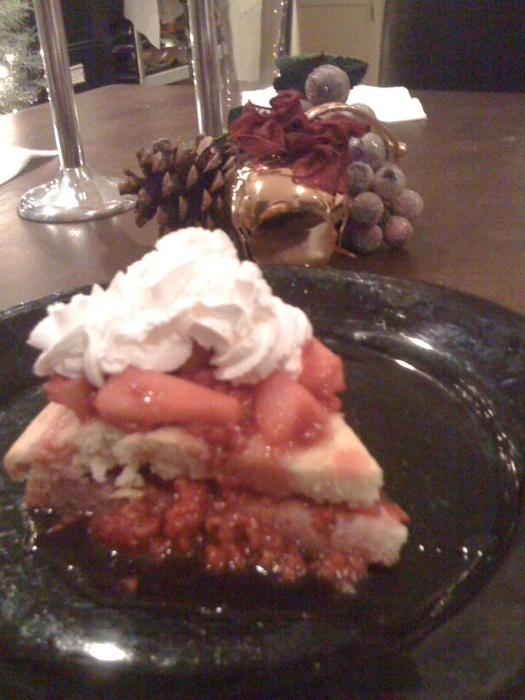 Top with remaining fruit and pour the coulis over the cake. Cover with the soy whipped cream. This is unbelievably tasty. And it’s a treat. This entry was posted on December 26, 2009 at 8:55 pm and is filed under Uncategorized. You can follow any responses to this entry through the RSS 2.0 feed. You can leave a response, or trackback from your own site.